Wilkes Playmakers are partnering with Alleghany Community Theatre of Sparta to bring a special event to Benton Hall at 7 p.m. May 6 and 7. 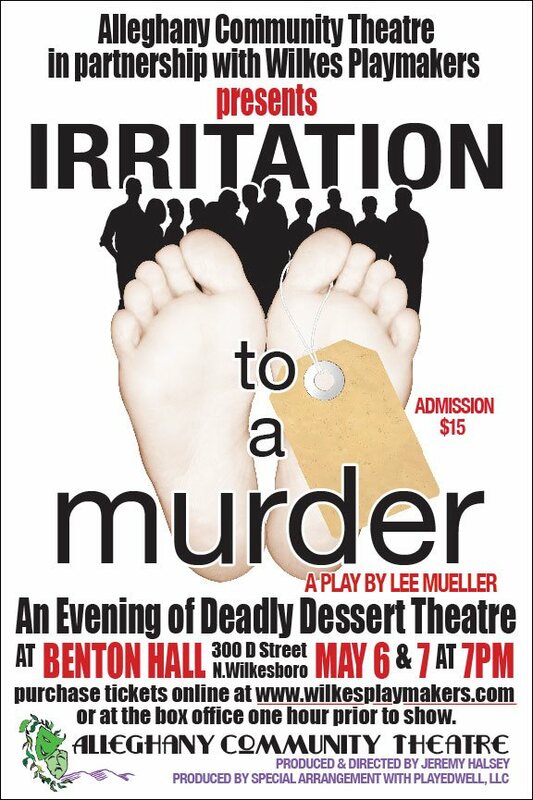 Alleghany Community Theatre will bring its production of the audience-participation murder mystery, "Irritation to Murder," by Lee Mueller to Benton Hall. This will be a dessert theater with scrumptious desserts, coffees and teas served in the Great Hall, theater officials said. ACT cast includes Michael “Poss” Hamm, Lily Nilo, Jasper Price, Kevin Bennett, Kelaiya LeMasters Davis, Trent Chappell, Jesse McCall, Donny McCall, Crystal Billings and Bridgette Sturgill. Many of these performers have professional training, as well as experience, having performed in a variety of stage and film productions, theater officials said. Seating is limited for this special event. All tickets are $15 and include the show and desserts. Tickets may be purchased in advance online at www.wilkesplaymakers.com or may be purchased at the box office one hour prior to showtimes depending upon availability.